I'm a huge fan of Luna Tea Cakes, and I like many of the flavors of Luna's regular bars as well. 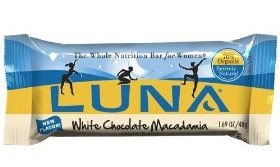 So, when I saw this White Chocolate Macadamia Luna bar at Whole Foods a week or so ago, I absolutely had to try it! The label says "new flavor" on it which is probably why I had never seen it before. I've been a big fan of Luna brand bars for a long time because I like what they stand for -- nutrition for women (although men can totally eat them too!) as well as natural ingredients, combined with great taste. The White Chocolate Macadamia bar far exceeded my expectations. It has just the right amount of crunch, macadamia flavor, and white chocolate essence to really satisfy my sweet tooth. The only drawback of the bar is that it is slightly higher in calories than some of the other low calorie bars that I love and have recommended. So, it is definitely one to keep in your cabinet for a special day vs. one to eat on a daily basis. The nutritional information for each bar is: 190 calories, 7 grams of fat, 3 grams of fiber, and 8 grams of protein (so 4 weight watchers points). As with most of their bars, it is also filled with many healthy vitamins and minerals. Additionally, here is a link to some other low calorie bars I've blogged about that I think are both tasty and full of good ingredients (including the super yummy Fiberful Bar (0 WW points), Gnu Foods Bars, Fruitabu, Attune probiotic bar, Clif Z Bars, and Figamajigs). I have got to try this. I tried the Cliff brand one in this flavor but it just didn't do it for me. I am having a hard time getting used to the high protein bars. Maybe they are an aquired taste? I've been trying to find that flavor everywhere. It looks great! I'm sure it'll be around here sometime soon! I NEED to find this one! Now I really need to jump on the Luna bar wagon! I've seen these around a few stores I frequent but haven't tried any yet. Thanks for the review! I'll pick a couple up the next time I see them. I just tried this bar and it was HEAVENLY!!! These are my absolute favorite breakfast food. If you buy them by the case at Whole Foods, they are less than $1 per bar.